Businesses often struggle to produce fine materials and nanomaterials at commercial scales. The U.S. Department of Energy’s (DOE) Argonne National Laboratory, long a leader in chemical process scale-up research for advanced materials, recently invested in new capabilities to address this challenge. Known as Continuous Flow Reactors (CFR), the technology can dramatically improve the consistency and efficiency of manufacturing the materials used in a wide range of applications. In today’s fine-materials manufacturing environment, chemical producers primarily rely on batch reaction processes, which create industrial chemicals in tanks heated to a predetermined temperature; once the process is complete, the reaction must stop for emptying the tank and replenishing the precursors. This involves a lot of starting and stopping that is labor-intensive and inefficient, and can result in batch-to-batch inconsistencies that are not acceptable in a production environment. By contrast, CFR processing eliminates the batch-to-batch variability. The material is produced continuously in the same reactor and using the same process parameters. There is no need to stop the process to empty and recharge the reaction vessel. The amount of material produced depends not on the tank size and number of batches, but on the time and the flow rates at which the continuous process is run. 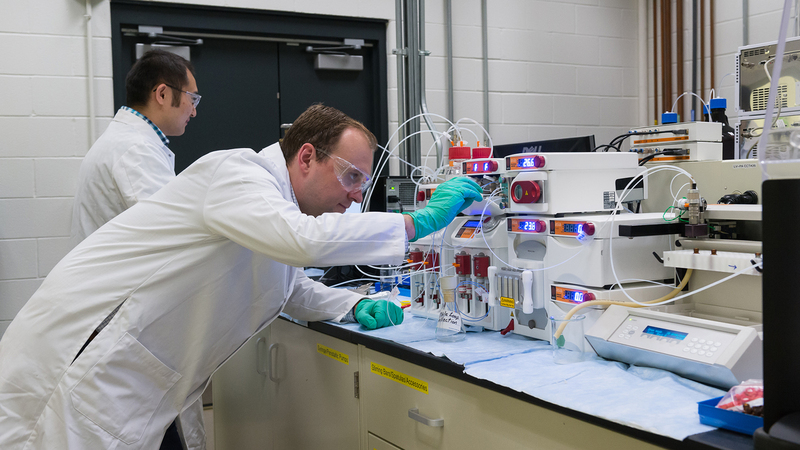 The Continuous Flow Reactor program is located at Argonne’s Materials Engineering Research Facility (MERF) outside Chicago. Researchers at the MERF can apply Argonne’s CFR capabilities to produce samples at pre-pilot-scale rates up to 100 grams of a single material. Pupek anticipates that they will be able to create specifications for highly efficient, custom microfluidic plates tailored to run specific chemistry. The custom microfluidic reactors can be used for many of the commercially available CFR systems. The program is also expected to develop highly customized processes using Argonne-designed systems that are not available commercially today. Argonne’s world-class in-situ diagnostics, characterization, computer modeling, scale-up technology and expertise in chemical and materials sciences support a wide range of research needs. Taken together, these capabilities enable the MERF to pursue process research and engineering advances that might not be possible in other environments, which is the driving force behind the laboratory’s Manufacturing Science and Engineering initiative. Although CFR facilities exist at other locations in the United States, Argonne is one of the first U.S. institutions to offer the breadth and depth of simultaneous in situ and operando characterization, simulation modeling and optimization capabilities to support process innovation. One example of this breadth is Pupek’s collaboration with computing researchers to develop new algorithms for robust optimization of CFR-synthesized materials. “The CFR setup at MERF is ideally suited for using active learning and optimization techniques to automate the navigation of the large parameter space and to deliver targeted nanoparticle properties,” said Stefan Wild, a computational mathematician at Argonne. Argonne has made it a core mission to develop advanced manufacturing technologies, such as materials with advanced properties and manufacturing processes that are more energy efficient. The CFR work was funded in part by almost $1 million in Laboratory-Directed Research and Development funds for Manufacturing Science and Engineering. Sign up here to learn more about Argonne’s technologies advancing manufacturing, including energy efficient processes and advanced materials design. Development of Argonne’s Continuous Flow Reactor research program and facility is funded by the U.S. Department of Energy, Office of Energy Efficiency and Renewable Energy, Vehicle Technologies Office, and Argonne’s Laboratory-Directed Research and Development funding program. For more information, contact Kris Pupek at (630) 252-1547 or kpupek@​anl.​gov. Formulating and solving challenging optimization problems! The Manufacturing Science and Engineering at Argonne newsletter brings you the latest news about advanced manufacturing research that you can collaborate on and technologies that you can license.